I grew up in a subsistence life where we farmed and fished for our food. My close ties to nature carried through with me during my college years where I really enjoyed classes that were fieldwork-based and outdoors. I spent a lot of my free time on camping and hiking trips and summers on internships that were in remote and beautiful places. It felt right to be in nature, and to be around people who felt the same sense of wonder and responsibility. I'm driven by the under-dog position that natural places hold against all the pressures that development, consumerism and the ever-expanding population growth pose - probably because I see myself as a bit of an under-dog too. Committing to this field gives me a sense of fulfilment that comes from supporting a greater cause and providing a service to the environment. Nowadays I mostly work at my desk, mapping and managing data, and communicating with other resource managers. 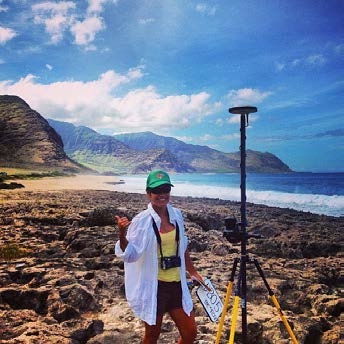 Every now and then we will go out into the field and work with partners and communities on projects such as mapping ocean uses, sea level rise, or surveying areas to ground truth elevation data. I also spend a lot of time training and building the capacity of local organizations to bring information together for decision making. One of my first jobs was as a mapping technician onboard the Summer Spirit - a small survey boat that we used to survey the ocean seafloor. We surveyed in many countries in the South Pacific and I got to see some really beautiful, undisturbed islands and underwater habitat. It was a heck of a time with a ton of fun but I also faced some very challenging situations from which I learned and grew a lot as young professional. I used to be a purist. I wanted to conserve areas strictly for the benefit of the ecosystem. Now, about 15 years into my career, I understand a lot more about the intricacies of the role that humans play. I believe a huge part of conservation is really much more about the management of people and that we need to be spending a lot of our resources on assisting communities, finding solutions or alternatives for the effective management and protection of ecosystems. Always be looking for fresh and exciting opportunities to volunteer, intern or study during school breaks and in-between career opportunities. The more diverse they are, the more exposure you get, and the more lessons you'll learn along the way. Such a repertoire of experiences help build up your skill set, looks great on your resume, and will provide a lot of material to draw from for writing applications and conducting interviews. Always be constantly aware of the connections you make and fostering those relationships because our field can be small, and more than likely you will end up working with or need the support of many of the professionals that you meet along the way.